GAME OF THRONES PREMIER TODAY OMG. my Game of Thrones makeup series! Today's look is based on R'hllor, the Lord of Light. or 'real' God in Westeros. 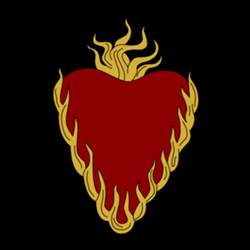 and who's also the guiding force behind Stannis Baratheon's movement. and often blood sacrifice, so I think the reds were definitely a good choice. This is a really cool eye look! I love the gold!